NetEnt’s brand new slot game release for May 2017 is with us at last. So, get splash happy with Scruffy Duck Slots. 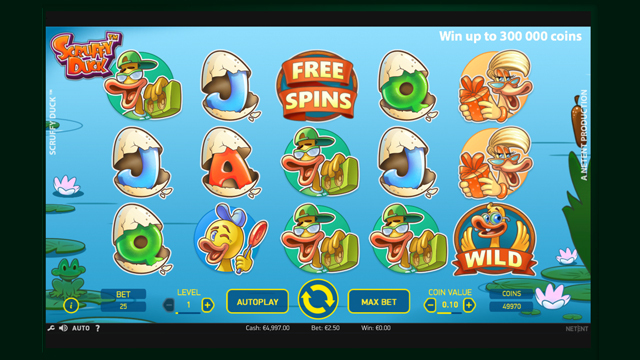 The game has 25 pay lines and a whole range of features, including expanding wilds, free spins and multipliers. Tie that in with some wonderful graphics and an intriguing musical bass tune in the background and Scruffy Duck is definitely going to endear itself to you. So, get ready to join the duck and all of his watery friends! Scruffy Duck from Netent will take you right down to the water’s edge. There, you’ll get to see pond life splashing and frolicking about. However, one of the pond’s ducks just loves staying dirty and scruffy. Who is that? Scruffy Duck, of course! The game offers up a standard five reel and three row interface, so you won’t find anything too confusing. A total of 25 different win lines are available for you to wager on. These cannot go through any sort of customisation, so the lines are set at 25 all of the time. The only changes that you are able to make relate to the bet that you bring into play. First of all, you can choose the value of a single coin. This has a range of between £0.01 and £1. Then, you can also change the bet level, which provides numbers between one and 10. This means that you have the chance to place a maximum overall wager of £250 per spin. On the visual side of things, players will find that there are some impressive graphics on display. Then again, this is something we have come to expect from Netent. The background provides the pond itself, with lily pads and frogs gracing it. Then, upon the reels is where you will find the icons of the slot. To begin with, there’s the blue J, the green Q, the yellow K and the red A. All of these are bursting out of duck eggs! Then, you’ll find four different duck characters. These are the daddy duck, dressed in business attire and clutching a mobile phone. Then there’s the mummy duck, bearing a gift in her hands. The cool, older brother duck has sunglasses on and a stereo. And finally, Scruffy Duck is last. While the ducks are swimming about on the lake, they’ll come across some friendly neighbourhood pond life. And these animals will all provide you with their own special features. First of all, there’s the wild duck. This duck will stand in for all other icons on the reels in order to form a winning combination. The only exception to this rule is the Free Spins symbol. However, it holds another function as well. If it manages to form part of a win, it will expand across the entire reel. This sees it turn from an ugly duckling into a beautiful swan! 15 free spins with a multiplier of times three. This sees all wins receive a triple multiplier. 12 free spins with symbol removal. A single symbol is removed from the reels. 10 free spins with colossal wilds. This adds a large wild icon to the reels. 8 free spins with random wilds. On every spin, between two and five wild icons land in random locations. 6 free spins with double feature. This selects two of the features at random to be in play during free spins. At Offersville we are big fans of Scruffy Duck Slot. It has the usual high class graphics from Netent, whilst also providing appealing gameplay and exciting special feature rounds which make the whole game a lot of fun.